Ruins of the Prambanan Temple, Tjandi Sewoe – Soekarta Residence. Published in 1852 – 56 by C. W. Mieling, The Hague. The temple of Prambanan in central Java is the largest Hindu temple ever built in Indonesia and one of the largest in Southeast Asia. Dedicated to the triumvirate of Shiva, Brahma, and Vishnu, the temple was built around 850 A.D. by the Mataram dynasty but abandoned soon after its construction. 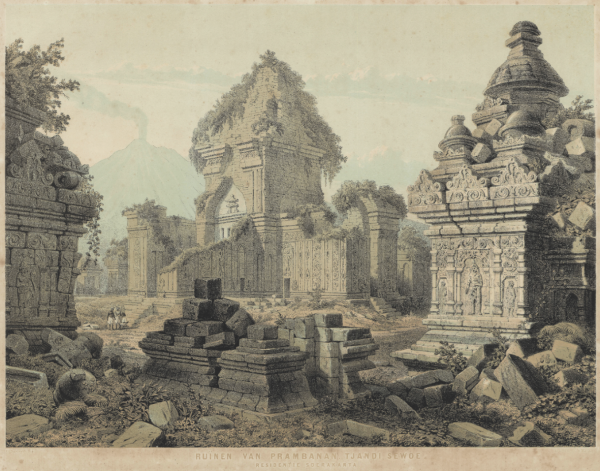 The Mataram dynasty practiced aspects of both Hinduism and Buddhism, and the temple complex includes some of the earliest Buddhist temples in Indonesia. Dimensions: 380 x 507 mm.